After scoring one run in game one, Seward scored 54 runs in three games to take the Dodge City series 3-1 at Brent Gould Field in Liberal. 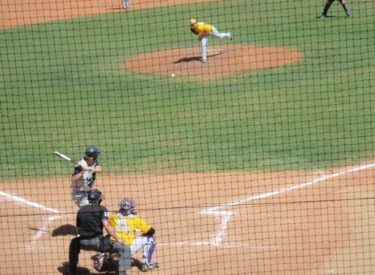 Seward swept the Conqs 12-2 in five innings and 17-7 in seven innings Sunday. In game one, Seward scored 12 runs despite only five hits. But Dodge City pitching walked 10 and beaned two. Jake Barrios hit his third homer of the season. Tyler Hill doubled twice. Paul Pulley (3-2) went the distance allowing three hits for the win. In game two, the Saints pounded out 17 runs on 17 hits. Brittain Ibbotson was 4-4 with five RBI’s, two doubles, and a triple. Jordan Dallalio was 3-5 with two RBI’s. Willie Gustin had his second four hit game of the series going 4-4 with three RBI’s. Keegan Hucul (3-3) pitched five innings for the win out of the bullpen striking out six and allowing just three runs with the wind gusting out at up to 50 miles per hour. Seward leads the Jayhawk West at 14-6 and is 25-15 overall. The Conquistadors, going for their first winning season since 2001, are 16-15 overall and 4-10 in the Jayhawk West. Seward plays at Clarendon Wednesday.